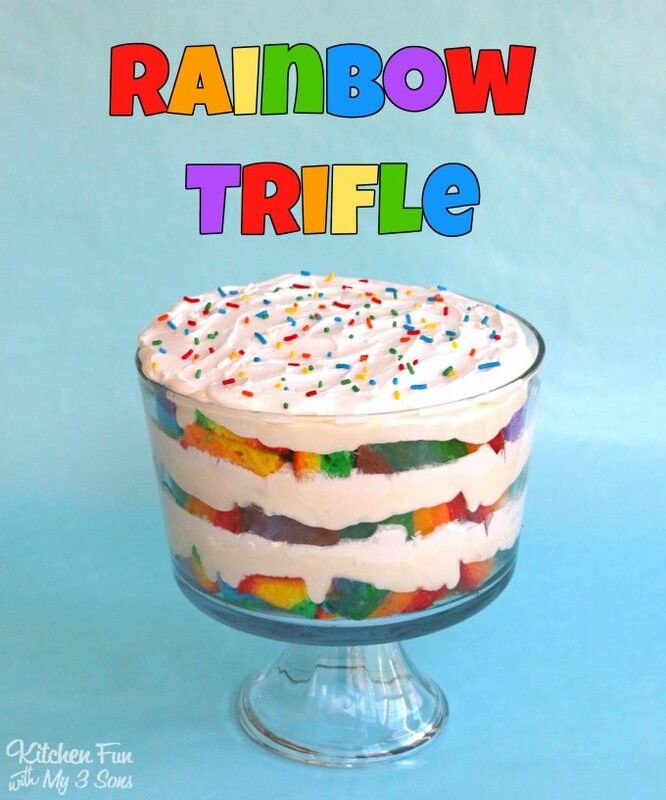 This beautiful Rainbow trifle is so easy to make! Such a fun party idea that everyone will absolutely love. 2 packages of Jello White Chocolate Instant Pudding - prepared according to the package directions. Prepare the cake mix according to the package instructions, then divide the batter into 6 mugs or containers. Add in your different desired food coloring to your cake mix. Pour half of your red batter into the first pan, reserving the other half for the second cake. Pour the orange right in the middle of the red and do the rest with the remaining colors. Tap the pan after each addition to help spread it out. Repeat with your second cake. Bake the cakes according to the package instructions, cool and remove. Slice your cake and add a single layer at the bottom of your dish. Add a third of the white chocolate pudding on top, then a layer of the whipped cream. Then start another cake layer and repeat two more times. Top the whipped cream and rainbow sprinkles.